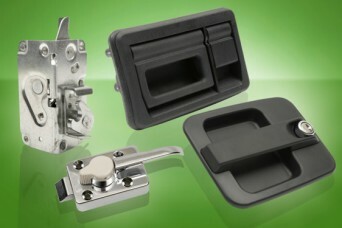 We have now packaged together our range of latches and handles, designed as standard solutions to the typical application problems experienced by specialist vehicle builders, into a single Transport Solutions Catalogue. Standard products are listed, along with details of our custom design service. Designers and production engineers involved with motor homes, caravans, trucks, vans, horse boxes, coaches, mini-buses, railway rolling stock, railway trackside installations, emergency service vehicles, boat fitting etc. may expect to find many useful latch and handle products in this program. The wide range of vehicle door closure, locking and opening, is addressed with flap handles, grab handles, lever handles and twist handles. Likewise, for access panels there are quarter-turn locks, compression swinghandles, recessed T handles, lever compression latches, storage box handles, slam locks and locks with visual open indicator as required for railway use. Compression locks are frequently required for high vibration situations on motor and rail vehicles, either as plain quarter-turns or with L/T handles. In addition the program offers specialist locks for fire protection situations and special keys in line with many national service specifications. Remote operation systems, e.g. for luggage compartment doors, are included, as are toggle latches and rotary lever latches, window spindle locks and wing type turn locks, sliding window locks and specialist horse trailer locks. Simple handle products included cover bow style and lever styles with flush pull handles for those situations where either a latch/lock is not required or where separation of function is preferred. 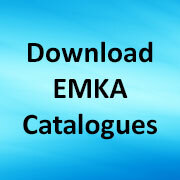 This represents a comprehensive program of latches and handles is expected to be of value to the wide range of vehicle designers and manufacturers operating in the U.K. and Europe – the catalogue can be downloaded here. Share the post "Vehicle Latch and Handle Solutions"